Amethyst is one of the most popular gemstones for spiritual jewelry, not just because of its mystical deep purple color, but because of its powers to stimulate, sooth and heal the emotions and physical body. Today it is considered a semi-precious stone and is not particularly rare, but at one time it was worth as much if not more than a diamond. 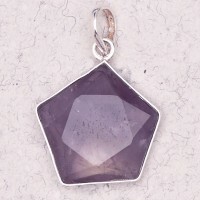 Amethyst is a form of quartz name from the Greek word "ametusthos" meaning "not intoxicated" based on an ancient legend that says it could prevent drunkenness. The wine god Bacchus, angry over an insult, vowed to have his tigers devour the first mortal he met. 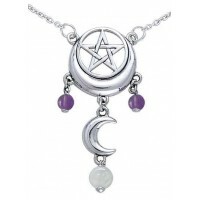 That mortal, however, turned out to be a beautiful maiden named Amethyst who was a priestess of Diana. When the tigers sprang to attack, the goddess heard the maiden's pleas and protected her by transmuting her into a beautiful clear crystal. Bacchus, taken by the dazzling beauty of the maiden and crystal, poured the juice of his sacred grapes over the stone as an offering for forgiveness turning it a lovely purple shade. Ancient Greeks and Romans would add Amethyst to their goblets either studding the vessel with them or placing one inside the bowl believing the wine would lose its power to intoxicate them. Catholic bishops wore Amethyst in a ring to protect them from mystical intoxication - kissing the ring was said to protect others. 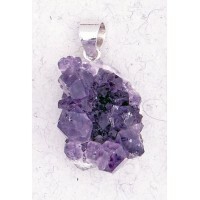 Other mystical properties attributed to Amethyst include control of evil thoughts, increasing intelligence especially in business, and protection for travelers. It was also said to protect soldiers on the battlefield and grant victory over their enemies. It could guard its wearer against black magic and protect against disease. 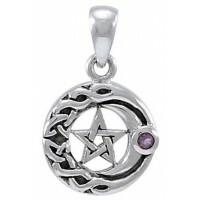 Purple, the color of royalty and mystics, connects us to the Divine helping to open the inner eye for dreaming and divination. In Egypt, it was known as Hemag and is mentioned in the Book of the Dead as the stone which should be carved into heart-shaped amulets for burial. It is said to provide a sense of mental peace and calm. It ranges in hue from light violet to a deep, rich purple. 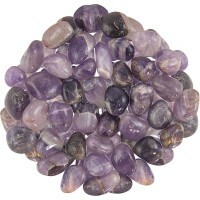 The most common uses of Amethyst today is to help open the inner eye, enhance meditation and divination. It helps bring focus, creativity and passion. In healing, it is a powerful tool against headaches or other issues of the mind. I like to lay on my back with an amethyst on my forehead to relieve a headache and keep a pear shaped piece of raw Amethyst especially for this purpose. Amethyst is one of the best crystals for meditation allowing a raise in vibration of the Third Eye encouraging the mind to surrender to that which is greater than itself to gain understanding and wisdom. 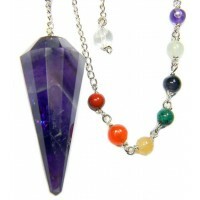 Hold an Amethyst crystal or cluster in the palm of the left hand pulling its energy thru your body infusing your aura with its power. 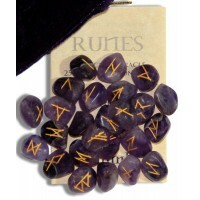 0 Comments To "Amethyst - The Magical Stone of Divinity and Royalty"